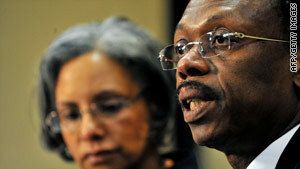 Jean-Bertrande Aristide, the former president of Haiti, says he is ready to return to his native country. The former Haitian president, exiled in South Africa since 2004, said Friday that he is ready to return to his native country. The Telegraph reports that Aristide called reporters to a hotel near Johannesburg's international airport and said, "As far as we are concerned, we are ready to leave today, tomorrow, at any time to join the people of Haiti, to share in their suffering, help rebuild the country, moving from misery to poverty with dignity." Aristide, Haiti's first democratically elected leader, was installed by a multinational force led by U.S. soldiers in 1994. But by 2004, the former Roman Catholic parish priest was accused of corruption. U.S. Marines came to the country to maintain order, and South Africa offered him safe haven. Haiti's current president, Rene Preval, was a long-time associate of Aristide, who appointed him prime minister and minister of defense in 1991. Yesterday, CNN reported that the Haitian native and cast member of the TV series "Heroes" was searching for his elderly parents in Haiti. Adding to his desperation to find them was the knowledge that the house he had grown up in had collapsed during the disaster, killing several of his relatives. On Thursday, Jean-Louis spoke with his mother in Haiti. "I got a phone call from my sister who said she was able to reach home," he said. "So I picked up the phone and my mom answered. The first reaction from both of us was simply to cry." His parents are sleeping outdoors for fear that their damaged home is not safe, and they are emotionally and mentally in rough shape, Jean-Louis said. He said there is still no word on many of the relatives and friends he has in Haiti. Jean-Louis was born in Petionville, Haiti, and grew up without electricity or running water. He moved to Paris, France, when he was 12 to pursue a modeling career and has been supporting his parents by sending money home since he started acting nearly 20 years ago. He is the founder of Hollywood Unites for Haiti, a nonprofit organization whose original mission was to provide sports and cultural education to underprivileged youth in the country. The group is now mobilizing for disaster relief. On January 15, 2009, the airline captain, along with co-pilot Jeff Skiles, guided the stricken U.S. Airways Flight 1549 into the Hudson River, saving the lives of all 155 people on board. In his autobiography, "Highest Duty," Sullenberger wrote that the landing was not a miracle, but rather the result of decades of practice and training. Nonetheless, immediately after the six-minute flight, Sullenberger was described as a true American hero and was invited to such events as President Obama's inauguration and the Super Bowl. He also was picked as the grand marshal of the 121st Rose Parade. "These new pilots may have exceptional training, and they may have a higher degree of ability. But it takes time, hour after hour, to master the science and art of flying a commercial jet," he wrote. Today marks the one year anniversary of the Hudson landing. Passengers and rescuers are scheduled to take a boat out to the spot where the plane landed. At 3:31 p.m., the time of the impact, the passengers will raise a toast to life. The professor of geophysics at Purdue University was among a group of scientists who warned Haitian officials two years ago that a devastating earthquake was likely to occur. In March 2008, Calais and others presented their findings on the major quake risk along the Enriquillo fault during a conference in the Dominican Republic. The Canadian Press reports that Calais and his fellow scientists again in May 2008 warned that hospitals, schools and key government buildings should be the first to be reinforced to withstand an earthquake, which they predicted to reach as high as 7.2. "We were taken very seriously, but unfortunately it didn't translate into action," he said. "The reality is that it was too short of a timeframe to really do something, particularly for a country like Haiti struggling with so many problems." Today in Atlanta, Georgia, the NCAA will honor the former Army football player and Iraq War veteran, along with the 2007 Bluffton baseball team, as 2010 Inspiration Award winners. According to Collegebaseball360.com, "The Inspiration award is presented to a current coach or administrator or to a current or former varsity student-athlete who, when confronted with a life-altering situation, used perseverance, dedication and determination to overcome the event and now serves as a role model to give hope and inspiration to others in similar situations." In March 2007, five Bluffton baseball players were killed in a bus crash, and the surviving team members went on to play the rest of the season. In May 2007, Gadson's patrol in Baghdad encountered an improvised explosive device, and he lost almost 70 pints of blood. Doctors at Walter Reed Medical Center in Washington amputated both of Gadson's legs. He went on to earn a degree from Georgetown University and still serves in the Army at the Army War College. He also helps researchers test prosthetic knee technology.